Zeitgeist Gallery is kicking off the second half of their 2011 INDETERMINACIES series with a performance by the PORTARA NEW MUSIC QUARTET. Portara Ensemble has been a choral entity since October of 2010. The Zeitgeist show will be the first time that the New Music Quartet will be performing without the collective. I’ll be recording the event for an upcoming Theatre Intangible podcast. Hope to see you there! Listen to the three previous INDETERMINACIES podcasts here. 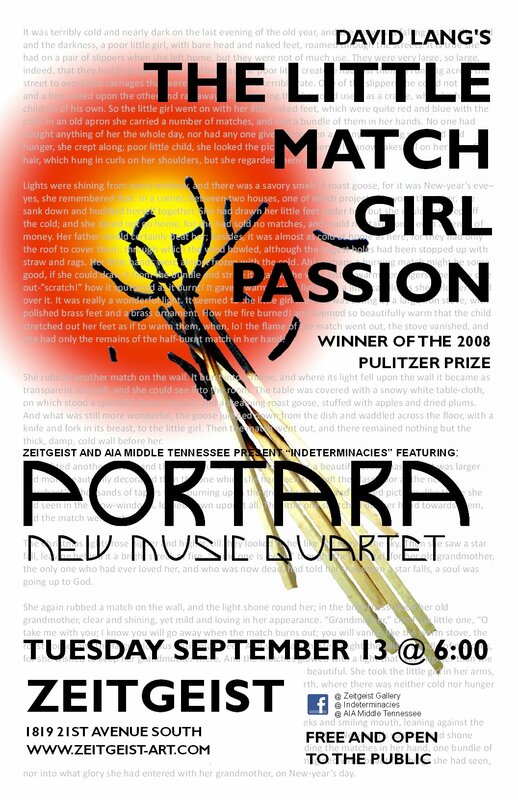 The PORTARA event happens Tuesday, September 13th at 6pm. Zeitgeist and AIA Middle Tennessee will begin the Fall 2011 season of their Indeterminacies programs with the Portara Ensemble Quartet performing David Lang’s 2008 Pulitzer prize winning work for voice “The Little Match Girl Passion”, 6-8pm at Zeitgeist, located on 21st Avenue South. The Indeterminacies events provide a forum for artists to present new works and a moderated audience discussion to explore the meaning in the works. Indeterminacies is free and open to the public. E067 Brainwaves 09/02/2011 Soundcrawl 2011 Expands to Three Programs of Sound Art – Free Tickets to Theatre Intangible Readers!